Reducing anxiety and pain are the two most documented benefits in Reiki medical research, and who doesn’t experience anxiety and pain in the dentist’s chair? 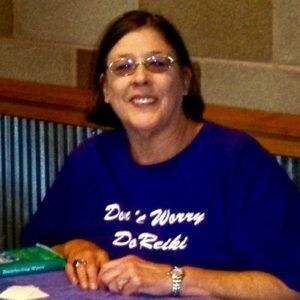 You’ll want to share this story of how self Reiki helped Paula Elofson-Gardine of Denver heal her dental and knee injuries and surgeries. And when, like Paula, you need a follow-up Reiki article to explain the Reiki practice difference, try How Does Reiki Help. Halloween 2014 was really scary! I took a bad fall while visiting Canada, tearing my meniscus laterally in both knees, and breaking off two teeth in my lower left jaw. Being away from home made recovering from the shock and pain of the injury that much harder. The orthopedist wanted to do knee replacements. I said, “No, thank you,” and stepped up my Reiki practice. Both knees are now much better. The teeth have taken longer. Due to many delays on my (former) dentist’s part, I was very concerned it could turn into a bone infection. And it did. I finally went to a new dentist. He took one look and said I needed a series of surgeries to fix my mouth. Specifically, I needed the bone infection scraped away, a sinus lift on the upper right, a bone graft, two implants, and the two broken teeth removed. OUCH! While removing the stitches after the first surgery, the oral surgeon said he was amazed at how well I healed from the surgery, that it looked really great. The oral surgeon outlined a plan of three surgeries to correct the damage. We started in May 2016 with a ridge augmentation so he could later place two implants where the broken teeth had been removed. Ridge augmentation means peeling the tissue away from the teeth and jaw, making cuts along the jaw bone to create room for the bone grafts and implants. The second surgery couldn’t be done until the circulation was restored to the area. Without circulation, the tissue would die. I returned to have the stitches removed three weeks after the ridge augmentation. Again, he was shocked by how rapidly I recovered from the surgery, saying the surgical area looked great. The second surgery was in late June 2016. I had healed so well from the first surgery that he was able to place the bone grafts and the two implant posts. He accomplished all the work in two surgeries instead of the expected three! What a relief! I asked if he wanted to know my secret. Of course he did! I told him I rinsed the surgical area with my WaterPik on its lowest setting to stimulate circulation and practiced self Reiki. He said whatever it was I was doing, I had demonstrated remarkable healing with each surgery. When I see him in a few weeks, I’ll bring a few Reiki articles to help him understand the expedited self healing he observed. That’s a good question, Val, and I don’t know the answer because I wasn’t involved; this is Paula’s story. I’ll reach out to her for a response. I did the usual self Reiki routine, then gave extra time with my hands on both sides of my jaw. I also like to just rest with giving Reiki to myself by placing my hands over my chest. I have a tear in my left knee due to a fall. How did Reiki help you with this? 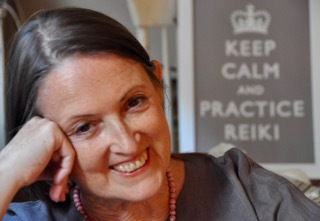 Dayle, Reiki practice accelerates the natural course of healing by optimizing your body’s self healing mechanisms. You might want to read How Does Reiki Help. 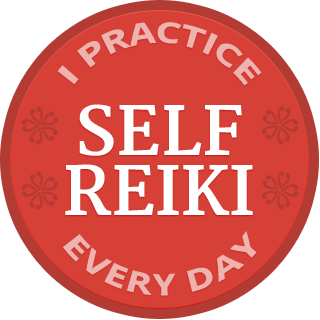 I’ve used self reiki even during the dentist visit, by laying my hands on my legs during the whole procedure. It helped me move my attention away from the head and even go though cavity repair without any anesthesia. The peaceful feeling Reiki gave me was enough to cope with it. That is awesome Diederik! I do a “pre dental appointment” preparation sending Reiki ahead to guide the dentist or surgeon’s hands and to keep myself calm and in a good space. Seems to work! A year ago I sustained a right ACL injury to my knee with a sudden fall in a wet bridge during a herb walk. I was among herbalists, one of which was a Reiki Master who immediately treated me on the spot. Once I was back at her house she gave me arnica to apply directing to the knee to reduce swelling and bruising. It was the quickest recovery from an ACL injury I have every had. How lucky for you to have Reiki hands there on the spot, Heidi! Getting treatment fast means a better outcome, partially because there is less swelling to be resolved. Doctors speak of the Golden Hour, or even the Platinum Half-Hour.